I’m not a big stencil person. Just gonna throw that out there. But when I was lost in Etsy world one day, this stencil spoke to me. Seriously. It was like “Hey, you, I know you want to buy me. 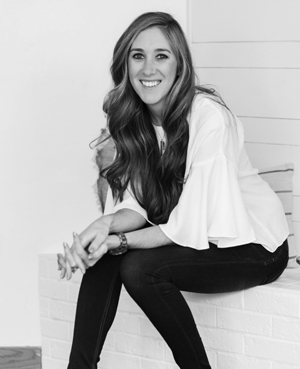 Go ahead, add me to your cart, you won’t regret it.” And it was right. 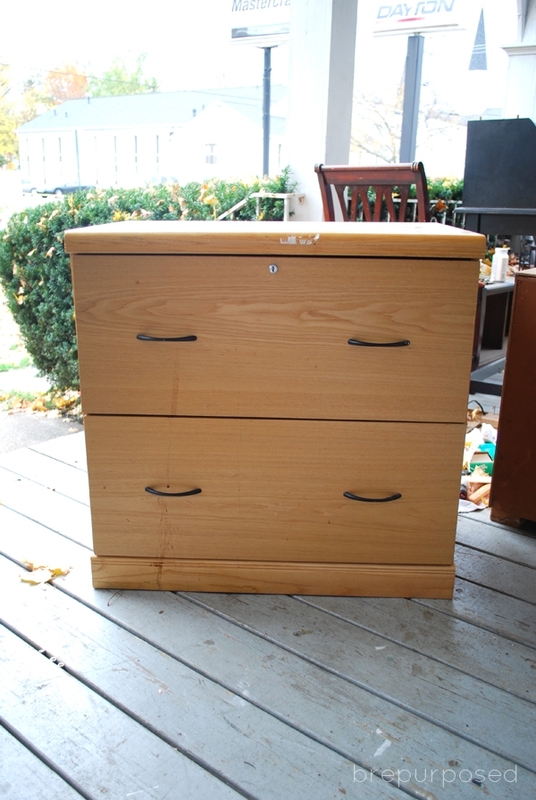 After the stencil came this old filing cabinet I got when I was in Pittsburgh from Construction Junction. If you live there, you have to go. It’s a heavenly place. I picked up this piece specifically for this post, but the color was the only thing I had planned. I wanted to stain the top so I gave it a light sanding and applied some stain but it just wasn’t taking the way I hoped. It wasn’t getting dark enough, and I just didn’t like it. Meh. So I decided to do some whitewashing. 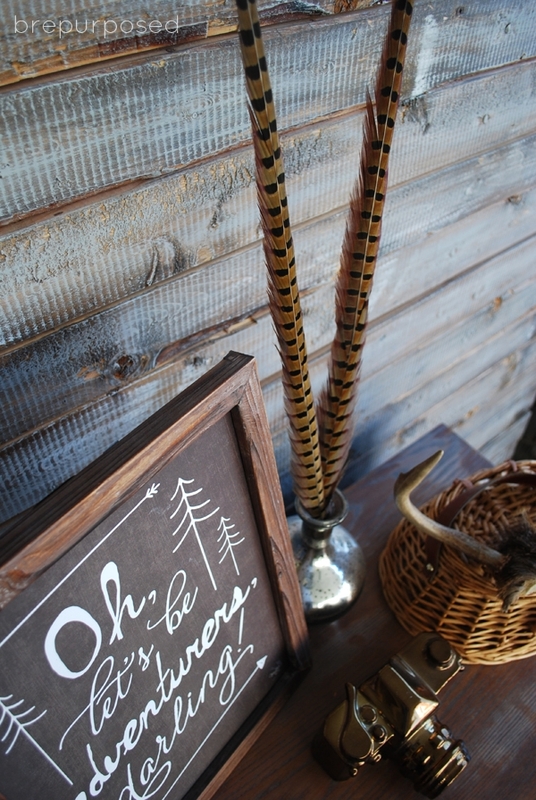 I used some left over Chalk Paint® in Old White mixed with water. I brushed it on with a foam brush and then wiped it off with a paper towel. A little friend even came to visit 🙂 I named her Fran. Now onto the paint! 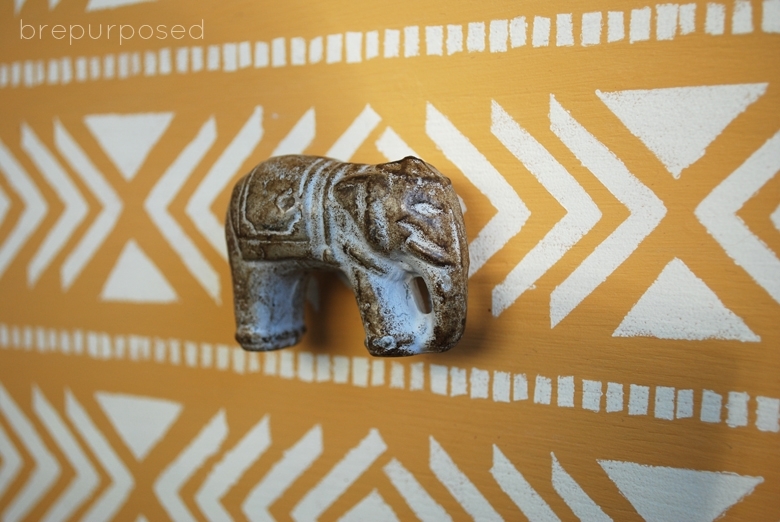 I used Chalk Paint® Decorative Paint by Annie Sloan in the color Arles, which was a first for me, and I definitely wasn’t disappointed! 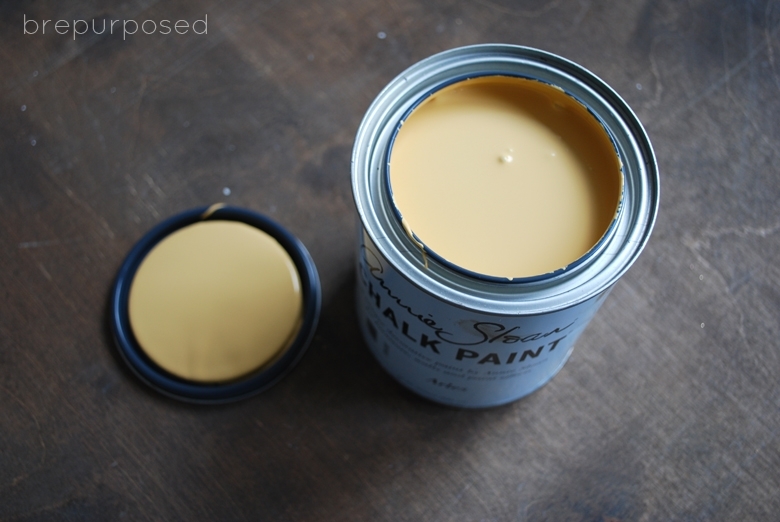 This color is gorg and I just can’t get enough of this paint and how smoothly it goes on. It’s my fav. I applied 3 coats and then once it was dry, got out my lovely stencil that I got here. 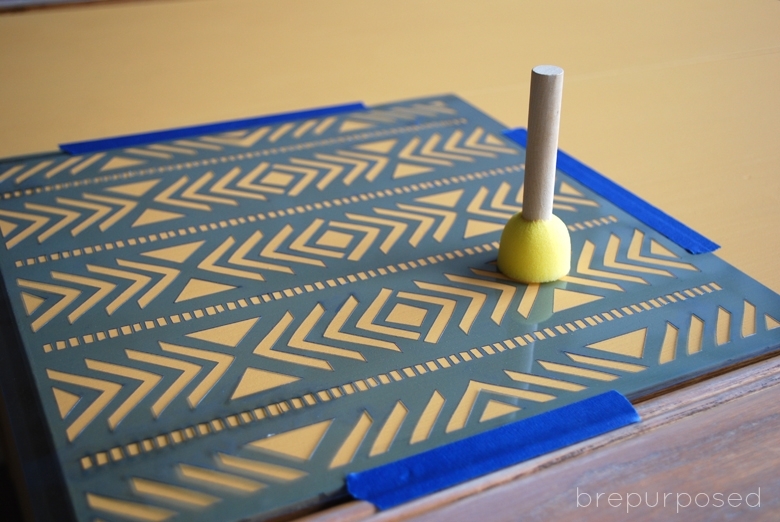 I love these little stencil brushes, they remind me of mini plungers and they make me happy. I used Old White again and just can’t get enough of this pattern. I want to use it on everything! To find your local Chalk Paint® stockist you can go here. I hope you don’t mind but I am totally copying this for my son’s dresser. I stalked this stencil on Etsy and am so excited to get started! Thank you so much, Hilary!! LOVE THIS! The color and pattern are seriously amazing! Thanks for sharing over at Motivational Monday! Thank you!! Love partying with you guys! Oh WOW. This looks amazing. 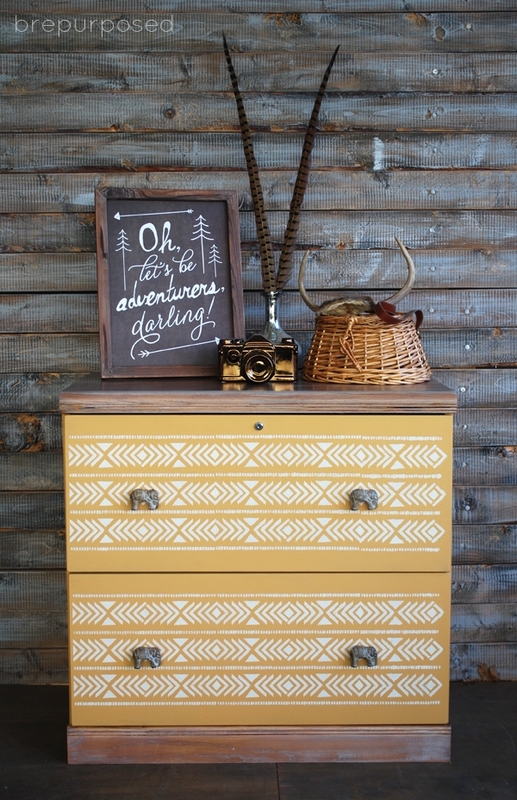 I love anything and everything Aztec and this makeover is absolutely beautiful. Hi Bre, Love the project as always! 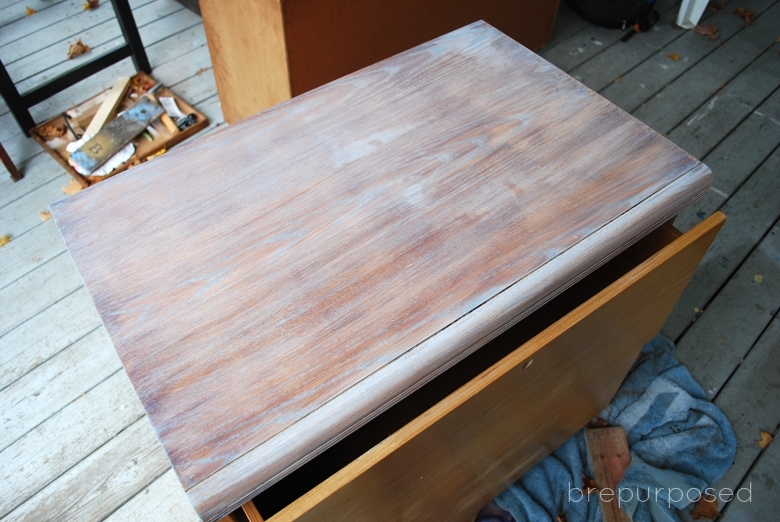 This project was featured over at our ReLoved Fridays! Thanks for linking up! I hope to see you again at this weeks party! 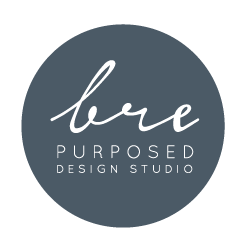 BTdubs, I read on your about page that you are a graphic designer…so am I! You have good taste girl! First off I love the color, the design pattern & to top it off your vignette. Decor / Re-purpose heaven! Aw thank you so much, Michelle!! Bre this piece is so cool! I love that you took a chance with that color (I don’t really think I’ve seen anyone use it before), and found that cool stencil! You crack me up with Fran, the mini plungers, and “the Hobs.” Great work, lady! 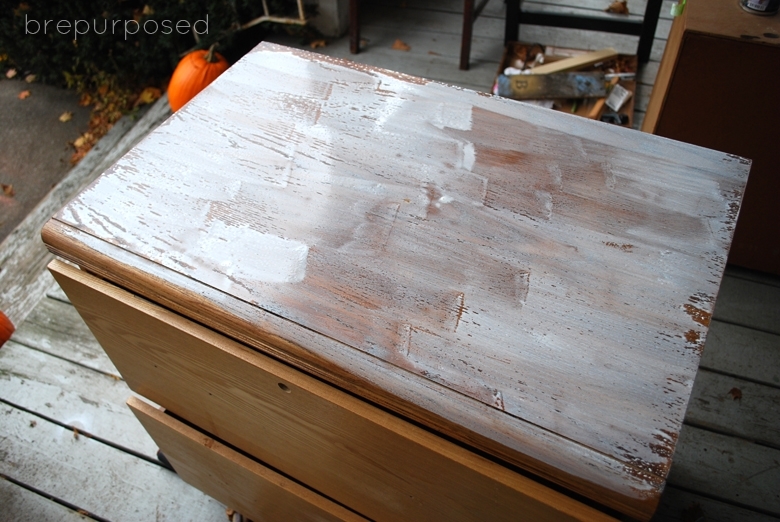 I’m in love with this Chalk Paint® makeover. 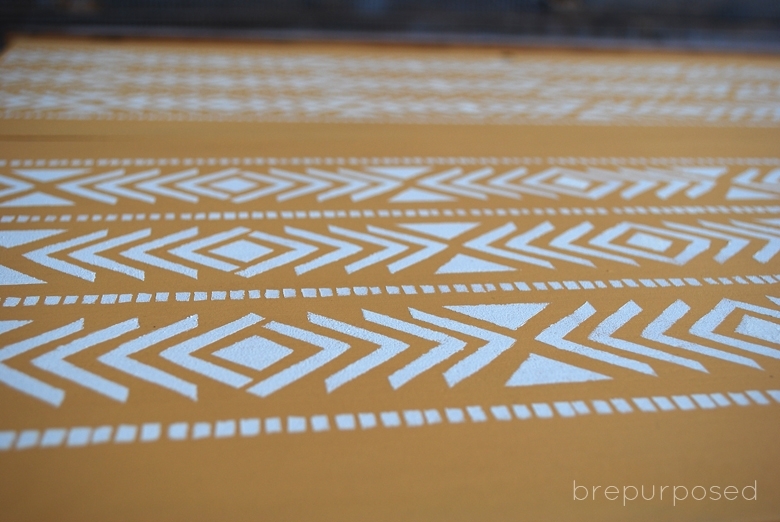 The Arles color with that yummy Aztec stencil is such a great combo. Love, love, love! Thanks for sharing Bre! Stunning! Great job. Thanks for the detailed explainations. I love the exotic feel of this piece! Thank you so much, Camille!! Hope you will stop by our party next week! I’m so glad you linked up to the Found & Foraged party!! I have to admit, the “before” would have been completely overlooked if I had seen it in a store…and you saw it and made it amazing. You have a gift!! So happy to have found you! Well, let me add my kudos. I have worked with Arles and think it is a brilliant color, but you have gone above and beyond. The stencil and the elephant hardware take it to a higher level. It is gorgeous. Wow! This turned out so great! Very unique! Thank you so much Jacquin! Thank you so much, Tania!! Stunning makeover-I love the yellow! Wow, that is beautiful!! I’m so impressed with all of your creations. I even like the chalkboard quote sitting on the cabinet. I’m pinning and sharing! 🙂 Glad to have you party with us at On Display Thursday! ummmmmmm are you kidding me with this Bre?!?!? I want this dresser in my house right now. Probably my favorite piece of yours yet, and that’s saying a lot. Very beautiful. I love the muted yellow with the stained wood look! This is an adorable piece! I love the whitewashing, stencil and hardware. Great transormation…I’m pinning! This turned out amazing, I would have never guessed the before and after were even the same piece. I love the pattern you used. 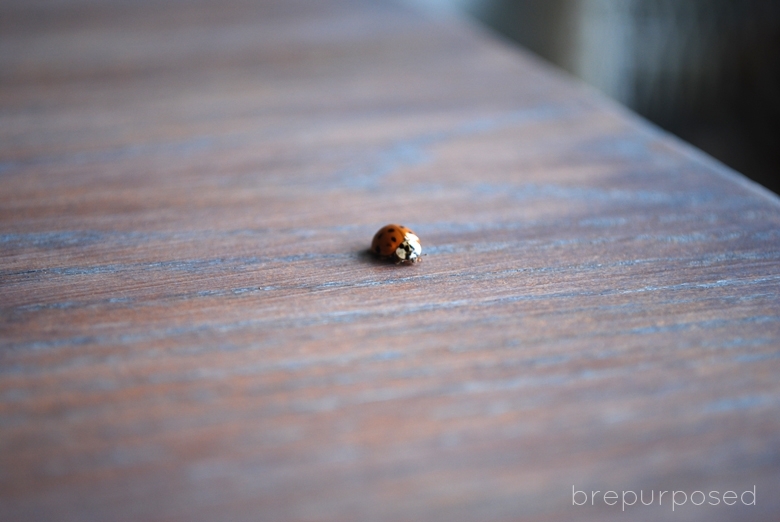 Thank you for linking up at Pin worthy Wednesday, this has been pinned! Thank you so much, Emily!! Have a great day! Lovely makeover! 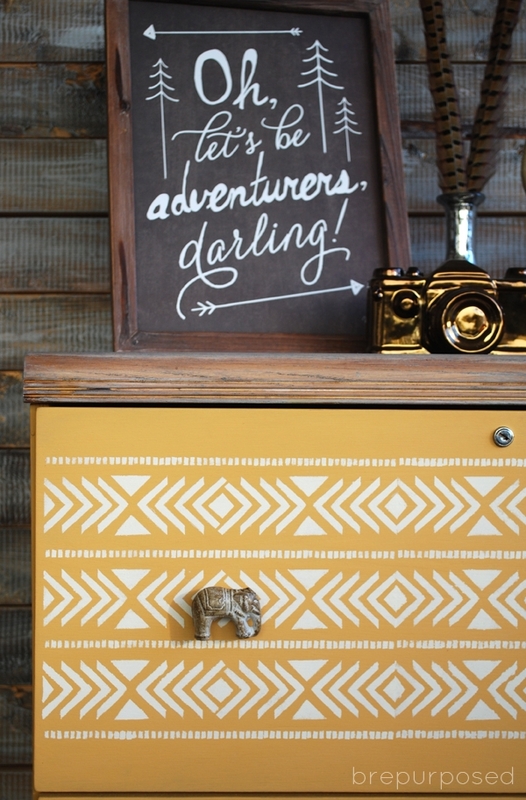 Love the stenciling and the color, gorgeous! That is really impressive; nice job! Gorg. eous. If I lived closer, I’d pay you cash right now and come get this bad boy!! I LOVE that color, and LOVE that stencil! It was the perfect choice!! This is so beautiful! I love it. The before and after is unreal. I think when my daughter is old enough for her own room I want to do something like this, funky and cool, but still not overwhelming. Thanks for the inspiration! Wow, I love your style! You did an amazing job! I have heard so many good things about this paint. Can’t wait to try it myself! What a great makeover! 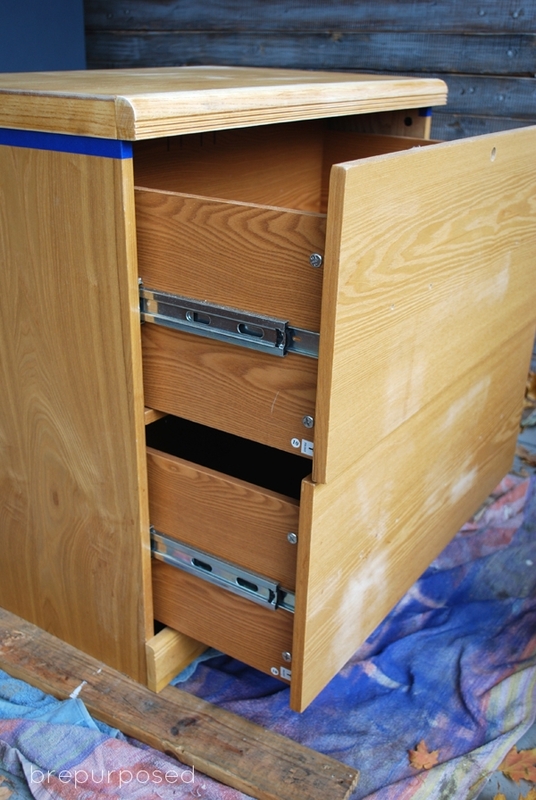 You really turned that file cabinet into something special! Love that stencil! I hope you’ll share this at my Creative Ways Link Party that just went live. Hope to see you there. Thank you so much, Nici! I linked up 🙂 Hope you have a fabulous day! I love it, Bre! Fabulous. I love it! I like that you left the wood elements on it! So pretty! Awesome makeover! For future reference on the drawer slides, if you pull the drawer out as far as it will go, there will be a black plastic lever on each drawer slide. On one side of the drawer the lever will be held up and on the other side the lever will be held down – this will release the drawer from the slides! 🙂 Hope this helps! Thank you Sonya! I definitely want to try it with dark wax too, I bet it looks amazing 🙂 Thanks for pinning too! This is seriously awesome! I loved it even before I saw the ‘before’ shot, and then my jaw dropped. Great job! Love that chalkboard sign too. Love the makeover! That stencil is fabulous and the white wash looks amazing! This is an absolutely gorgeous makeover! 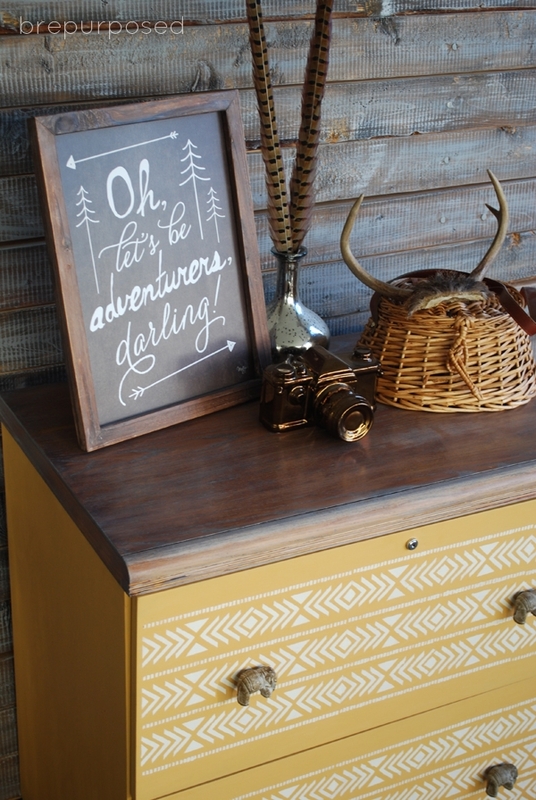 I love the colour, the stencil and the drawer pulls – just fab! Great job Bre! The drawer pulls are awesome. The white washing gives a great effect. So many techniques going on in one piece but it all works so well. wonderful redo!! Love the color choices and the stencil! I can NOT believe the transformation!! Love that shade of yellow, too. Gorgeous, Bre! 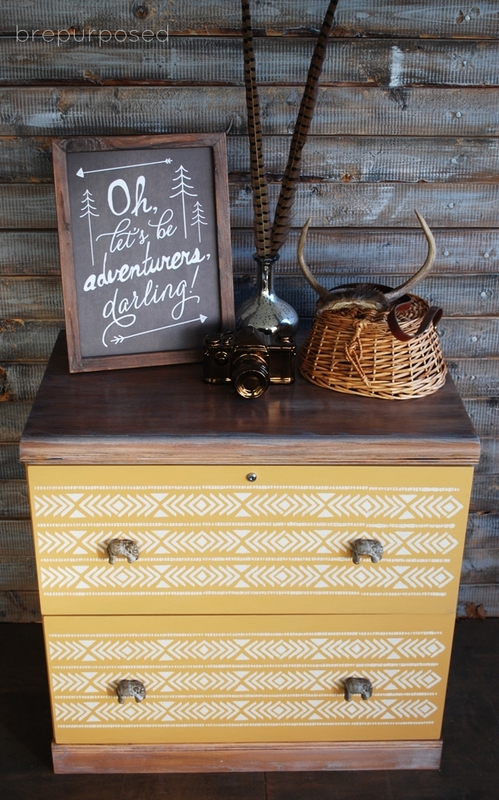 Love the stenciling and those knobs are perfect! Thanks Amy!! Hobby Lobby has the best knobs! Oh wow, I absolutely LOVE this. Great job! Thank you so much, Tanya!! I am loving this little filing cabinet! You made it look AMAZING!! PINNING! Oh my word!! 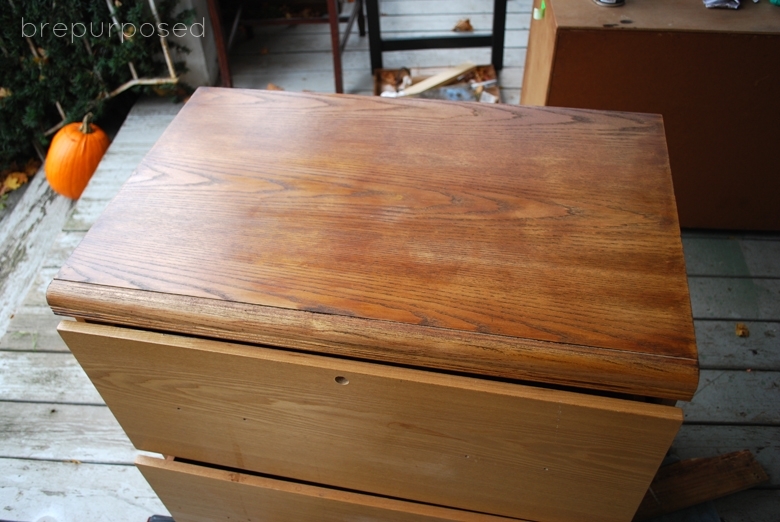 You did such a GREAT job on this dresser!! WOW! Doesn’t even look like the same piece. LOVE IT!! Oh Bre! What a GORGEOUS colour and that stencil is SO fab! Love the whitewashed top too – I think it all works together perfectly!!! Thanks Kristi!! I was so excited to find such a fun pattern 🙂 I can’t wait to use it again! I love this makeover! Nice job!